Typhoon MAWAR passed west of Daitojima Islands and is moving to south of Honshu Island. Daitojima Islands entered into the right side of the moving direction of the typhoon, which caused strong winds and heavy rains, and damages such as blown roofs and overturned cars. The typhoon has passed its peak intensity, but is forecast to draw near to Izu Islands. 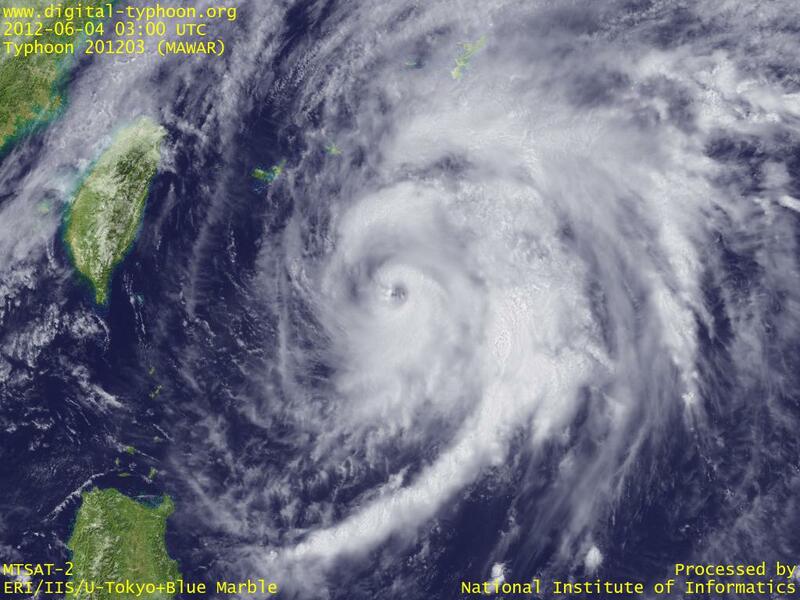 Typhoon MAWAR is intensifying in south of Okinawa Islands. Its track is generally more northward than the initially forecast, and now it is expected to move close to Okinawa Main Island and pass between Daitojima Islands. The image below shows that the typhoon has an eye now, but the boundary of the eye is not clear, so the intensity of the typhoon remains to be "strong." Typhoon MAWAR was formed in east of Philippines. It is forcast to turn to north and north-north-east and reach south of Okinawa Islands.